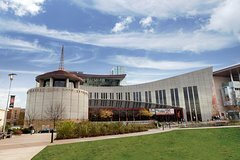 The Country Music Hall of Fame and Museum isn’t just a museum, it’s an experience, an exciting and entertaining destination in Nashville with something for everyone. Rhinestone costumes, seasoned instruments and tear-stained lyric sheets are only the beginning. Add incredible architecture along with famous southern hospitality, and a day at the museum turns into the memories of a lifetime. Savor a southern meal at Two Twenty-Two Grill & Catering and finish off the day by shopping at our Museum Store. Real stories that must be told - that’s what you'll experience at the Country Music Hall of Fame and Museum. Start your journey through country music history with Sing Me Back Home: The Journey Begins, Folk Roots to the 1960s. This exciting multi-layered experience tells the story of country music’s humble folk roots, and tracks its evolution into the 1960s. In 2010, the museum opened an all-new exhibit experience, expanding on Sing Me Back Home with Dreaming My Dreams: The Journey Continues, 1960s to the Present. This expansion included the addition of hundreds of new artifacts and multimedia elements that focus on country music’s recent history. The history comes to life with every era of country music represented.